We currently travel anywhere in Michigan. 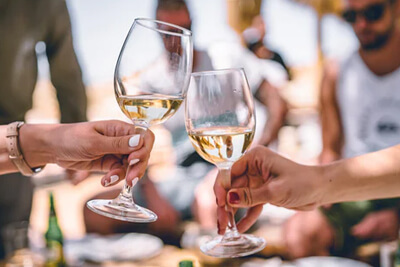 There are plenty of wineries to visit across Michigan and it's always a good idea to be safe and have designated transportation to take you to wineries. We can accomodate parties of up to 35 and can take you to any winery you choose. If you are unsure of where to go give us a call and we can help you choose some places and even call ahead for you to set up reservations. Browse our listings of wineries below or visit the office website of Michigan's Wine Industry. Garden Bay Winery's vineyards are located on the Garden Peninsula, with a winery tasting room in Munising. The vineyard's wines have recently begun winning awards at the New York Finger Lakes Wine Competition, where they took home a gold medal for their raspberry wine this year. This Michigan winery produces six grape wines, including a Riesling, Traminette, Pinot Grigio, and Demi-Sec, as well as a Peninsula Red and Harbour Red. Their award-winning fruit wines are raspberry, blueberry, strawberry, sweet blueberry, and a blackberry wine called Northern Lights Out. Garden Bay Winery in Michigan's Upper Peninsula welcomes visitors at their vineyard, which overlooks the old Garden Golf Course and all its wildlife. The Threefold Vine winery and vineyard is located on Michigan's Garden Peninsula, where the Green Family operates their farm. The family welcomes guests to come by and get a taste of the wine, as well as the way the wine is produced. The family planted the vines for the first time in 2002, and began winning awards in 2007. With five red and one white table wines, honey, fruit, and dessert wines, the small vineyard is quickly becoming one of Michigan's favorite winemakers. Between May and October, the vineyard and winery are open daily from noon to 5pm, and during limited hours during the rest of the year. In the late sixties, Adam Kolodziejski was a newly married college student. Broke but with a taste for wine, he began making his own from the wild grapes that he found growing along a local river bank. Although his first attempt wasn't a success, he has perfected the art of winemaking over the last 40-plus years, and his Michigan wines are now known for their balance and distictly smooth flavors. The vineyard is open Friday through Monday between 11am and 5pm, with the exception of Sundays, when they open at noon. Guests are welcome to come by and sample the wines, learn about how the grapes are grown, and meet the vinter himself! In 1999, Stone Acres Winery established its business in Northeast Michigan by selling beer and winemaking equipment to those who crafted their own beverages as a hobby in their homes. All the while, they were growing their own vines, before introducing their first bottles to the public in January 2003. They produce a red and white grape wine, as well as apple, blueberry, strawberry, and raspberry fruit wines. Stone Acres welcomes guests, and requests that large groups contact them before arrival so that they are equipped for the visit. Nicholas Koklanaris arrived in Michigan in 1951, at the age of 17, from Icaria, Greece. Forty years later, he began planting vines, opening a winery in 1999. He prided himself in working with hearty grape varietals that could withstand Michigan's harsh winters. After Nicholas passed away in 2005, his nieces took over the business and continue to make award-winning grape wines. The Cheboygan, Michigan vineyard is open daily from 10am to 6pm. Large groups are encouraged to call prior to visiting. Both Cornel Olivier and Chris Baldyga, owners of 2 Lads Winery, grew up in families where wine was part of everyday life. Olivier learned about grapes and winemaking on his family's farm in South Africa, while Baldyga's mother worked for an Old Mission Peninsula winery. They joined forces to put together an ultra-contemporary facility that utilizes the latest technology to create aromatic, highly balanced wines. Their beautiful, chic tasting room is open Monday through Saturday from 11am to 6pm, and on Sunday from 11am to 5pm. Groups of 10 to 20 must make reservations at least 48 hours in advance of their visit. Located just north of Traverse City, Michigan, this winery handcrafts wines made from their family's farms. They have been growing fruit in Leelanau County for decades, and have since ventured into creating a variety of grape wines and even a new cider. Their newly designed tasting room/barn is open to the public. Hours vary by season, so check their website for details. Large groups are welcome — the space is huge, and equipped for lots of visitors! For over three generations, the Simpson Family has been growing fruit on the Leelanau Peninsula. Originally cherry farmers, Bruce Simpson turned the farm into a Michigan vineyard after obtaining a degree in agriculture and another in vinticulture and enology at the University of California Davis. Since 1980, Good Harbor Vineyards has been crafting respected wines at an affordable price with Vitis Vinifera and French hybrid grapes. With over 65 acres, there's a lot of vineyard to visit when you travel to Good Harbor. Large groups should contact the Simpsons to ensure that the staff is prepared for a visit of 10 or more guests. The owners of Longview Winery met and fell in love at a conference in the mid-90s, but they lived across the country from one another and endured a long-distance relationship. Alan asked Linda to look at the "long view" of their lives. When they married, Alan asked Linda what she saw as their long view future, and she told him she wanted a farm in Leelanau. They began growing vines in 1998 and haven't looked back since. Their cozy tasting room serves up Longview's award-winning Michigan wines. Since the tasting room is quite small, large groups should request accommodations at least two days in advance of arrival. A small group of northern Michigan farmers grows the organic fruit used in the wines and hard ciders of Northern Natural Organics. This Michigan winery believes in supporting the health and nature of Northwest Michigan, and consistently provides classes on natural health at their winery. The tasting room is open Monday through Thursday from noon to 6pm, Friday and Saturday until 7, and Sunday until 5pm. Try their assortment of apple, blueberry, and apple cherry ciders, as well as their fruit wines. Blue Water Winery is located just off of Lake Huron, with 16 acres of premium wine grapes. This is a Michigan winery that doesn't take themselves too seriously. They strongly believe in infusing their vineyard with a sense of fun by regularly hosting events. Their tasting room is open daily, serving up their award-winning Sunrise Coast red wine and Dry Riesling. Their motto, "Think globally, drink locally" is infused in everything they do. Lone Oak Vineyard Estate is Southeast Michigan's oldest and largest vineyard. Their 12 European grape varieties are grown on a 25 acre site with ideal soil conditions. They bottle a Cabernet Sauvignon, Merlot, Pinot Noir, Chardonnay, Riesling, and a selection of dessert wines. In addition, they host events almost every weekend, with music and food. They're open to the public Monday through Saturday from 11am to 5:30pm, and from noon on Sundays. Wolcott Winery is a newer winery located on Michigan's Mount Morris. They offer a large selection of red and white wines crafted from their own fruit at Wolcott Orchards. Wine lovers can take advantage of their vineyard membership, which includes invitations to members-only events, VIP invitations, VIP seating and parking, 10 percent off all wine and accessories, 10 percent off gift baskets, and in-home wine tasting parties. They often take place in local events, including Octoberfest Antique and Collectible Show! Contessa Wine Cellar owner Tony Peterson is a third generation winemaker. As an apprentice to his father, he dreamed of owning his own vineyards and incorporating old world wine making with new world amenities. Contessa Wine Cellar is the result -- an elegant Italian villa-inspired tasting room on a spectacular orchard overlooking Michigan's Coloma Valley. An extensive list of red, white, rose, and fruit wines is offered at reasonable prices. Free wine tastings are held daily for individuals; groups of 12 or more should call for reservations. Large groups may need to pay a small tasting fee. Karma Vista vineyards and winery may be one of the newest Michigan vineyards, but it's owned by owned by one of the oldest farm families in the state. Located just a few miles from Lake Michigan on a hill overlooking Coloma, Karma Vista is a beautiful, scenic vineyard perfect for an afternoon tasting. Their wines are already receiving rave reviews! Enjoy a tasting Monday through Saturday (closed Tuesdays) from 11am to 5pm, and Sundays from noon. Groups of six or more must make reservations; the tasting room does not have capacity for groups larger than 11. St. Julian is the oldest of Michigan's vineyards, celebrating 90 years of excellent wines this year. In 1998, St. Julian Winery was the first vineyard outside of California or France to receive the prestigious Tasters Guild International "Winery of the Year" award. With over 40 world-class wines, eight alcohol-free juices, brandy, vodka, and sherry on its list of products, there's something for everyone in your family.